Clare Surval credits National Jewish Health for saving her brother's life. 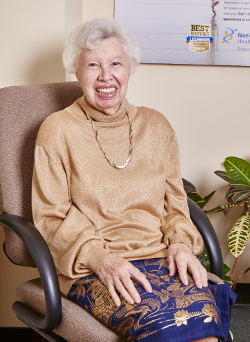 For 50 years, Claire Surval, of Queens, New York, has shown her support for National Jewish Health in a variety of ways. She has helped to raise money by managing a thrift shop, running bingo games, coordinating luncheons and, most recently, giving through a charitable gift annuity. And it all began in the 1950s when Claire believes the institution saved her brother's life. Her brother, Allan Abramson, was a patient at the National Home for Asthmatic Children for three years. "The home" eventually became part of modern-day National Jewish Health. "I've always felt an allegiance to National Jewish Health," Claire says. "My brother was severely asthmatic as a child and I'm not sure he would have survived. Being at the home gave him coping skills he might not have had and taught him not to panic during an asthmatic attack." Recently, Claire decided to continue the legacy of her support through a CGA. A CGA through National Jewish Health provides fixed income for life, while also supporting the mission of the hospital. There are tax benefits to CGAs as well. The initial gift is partially income tax-deductible and the CGA payments are partially income tax–free. "It's a wonderful way to make a donation," Claire says. "I'm enjoying getting a good interest rate for the rest of my life and the partial tax break is a plus as well. I feel it's a wise decision." Claire's work on behalf of the institution began five decades ago when her mother was asked to volunteer. Her mother joined the Concourse auxiliary chapter in the Bronx and eventually, Claire did, too. "My mother instilled in me a sense of social values and wanting to help others," she says. Throughout the years, Claire has donated time and money on behalf of National Jewish Health and spread the word about the institution and its exceptional patient care and research. "The work was very gratifying and it still is," Claire says. She's even made friends with people from Florida to Arizona and California, while volunteering and fundraising on behalf of National Jewish Health. "We became like a family and all knew each other," she says. "We exchanged ideas and helped each other." Today, five decades later, National Jewish Health remains Claire's favorite charity. "There is no place like it," Claire says. "I know that when it comes to respiratory and immunological diseases, if there's a hope for cure, it will probably come from National Jewish Health. It's a very special place." Contact Gordon Smith, MBA, CFRE at 1.800.423.8891, Ext. 6549 or giftplanning@njhealth.org today to learn how you can plan a gift that provides you with income for life. We can explain your options in more detail and provide you with an illustration of your potential benefits. A charitable bequest is one or two sentences in your will or living trust that leave to National Jewish Health a specific item, an amount of money, a gift contingent upon certain events or a percentage of your estate. "I give to National Jewish Health, a nonprofit corporation currently located at Denver, CO, or its successor thereto, ______________ [written amount or percentage of the estate or description of property] for its unrestricted use and purpose." A donor advised fund is an account that you set up but which is managed by a nonprofit organization. You contribute to the account, which grows tax-free. You can recommend how much (and how often) you want to distribute money from that fund to National Jewish Health or other charities. You cannot direct the gifts. You fund this type of trust with cash or appreciated assets—and may qualify for a federal income tax charitable deduction when you itemize. You can also make additional gifts; each one also qualifies for a tax deduction. The trust pays you, each year, a variable amount based on a fixed percentage of the fair market value of the trust assets. When the trust terminates, the remaining principal goes to National Jewish Health as a lump sum. You fund this trust with cash or appreciated assets—and may qualify for a federal income tax charitable deduction when you itemize. Each year the trust pays you or another named individual the same dollar amount you choose at the start. When the trust terminates, the remaining principal goes to National Jewish Health as a lump sum. A charitable gift annuity involves a simple contract between you and National Jewish Health where you agree to make a gift to National Jewish Health and we, in return, agree to pay you (and someone else, if you choose) a fixed amount each year for the rest of your life.